The Greek government made another payment to the International Monetary Fund earlier this month. This time it was just 450 million euros, a relatively manageable amount compared to the 1.5 billion that Greece had to pay back to the IMF in March. Each of these payments brings relief that a possible default has been avoided, but they also bring greater anxiety that a default is getting closer. Greece has not received any bailout funding from its lenders since August but has kept meeting its debt payments. This has left the new government, which is still unable to agree on a set of reforms to unlock further funding, desperately short of cash. In order to cover its international and domestic obligations, the SYRIZA–Independent Greeks coalition has been scraping together money from wherever it can find it. 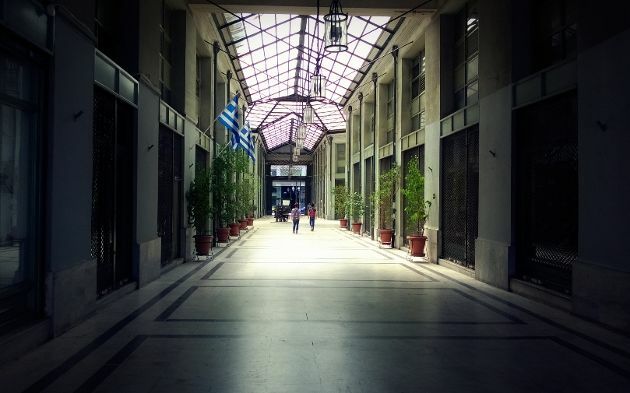 The state received 641 million euros from the Bank of Greece’s 2014 profits in late February and 556 million from the Hellenic Financial Stability Fund, which were fees paid by banks in 2012 ahead of their recapitalisation. On top of these bonuses, the government has been digging in to the cash reserves of several general government bodies to pay its debt obligations, which include the rolling over T-Bills that were held by foreign investors who are no longer renewing their investment. These T-Bill issues are likely being covered by Greek lenders and the central Bank of Greece, further draining the liquidity in the country’s economy. In fact, while all the attention has fallen on the government’s battle to squeeze liquidity from wherever it can, the devastating impact that the prolonged uncertainty is having on the real economy has gone somewhat unnoticed. One clear effect has been that in order to pay salaries, pensions and lenders, the government has held back on payments to suppliers. By the end of March, the coalition’s primary expenditure was 1.2 billion euros below the budget target, suggesting that non-payroll costs are being held back ensure that international debt obligations are met. The failure to release this money is having a damaging impact on the liquidity in the Greek economy, which has also taken a hit from the withdrawal of almost 25 billion euros (or 15 percent of total deposits) between December and February. Deposit outflows have slowed since the February 20 agreement between Greece and its creditors for a four-month extension to its bailout programme. However, it is clear that the Greek banking system, which has less than 140 billion euros in deposits left, is precariously balanced and even a slight shock could place it in an unsustainable position. The real economy, meanwhile, has to absorb the impact of these negative developments. Greece’s GDP contracted by 0.4 percent in the last quarter of 2014, after rising by 0.7 percent in the previous three quarters. The negative trend is expected to continue in the first quarter of this year and possibly beyond. On Wednesday, Standard & Poor’s downgraded Greece’s long- and short-term ratings by one notch to “CCC+/C”. It estimated that the Greek economy has shrunk by 1 percent over the last six months and forecasted that it will contract by 1.5 percent of GDP this year. Exports have been falling since the start of the year and banks are also seeing a new rise in the formation of non-performing loans, possibly by as much as 3 billion euros in the first quarter of 2015, which is equivalent to the increase for the whole of 2014. Anywhere you look, it is clear to see that the Greek economy is being strangled. The most immediate way of resolving this desperate situation is for there to be an agreement between Greece and its lenders. It now looks highly unlikely this will happen within April, despite Prime Minister Alexis Tsipras insisting he is “firmly optimistic” of a deal very soon. The possibility of Greece doing everything needed to secure all of the 7.2 billion euros of bailout funding remaining (including 3.5 billion euros from the IMF) before the end of June, when the current bailout extension expires, seems unlikely. The best-case scenario seems to be that a set of reforms will be agreed that triggers the release of enough funding to get Greece through until the end of June. Athens has just over 1 billion euros in debt obligations (including another 880 million euros to the IMF) to pay in May and it seems unlikely that it can do this without receiving at least some funding. The problem is that Greece and its lenders seem far apart on the type of measures that the government needs to adopt. As they have done throughout this crisis, creditors are demanding policies that will produce measurable results on the fiscal side, such as cuts to supplementary pensions and an increase in VAT on Greek islands. The coalition, however, wants to introduce new measures that it believes are not recessionary. It proposes for instance, clamping down on tax evasion and introducing a new system for public procurements that would save money. The institutions, however, feel they cannot trust the projected revenues and savings from such measures. This leaves the two sides at a standoff and with a considerable distance to cover in the next few days, especially if one takes into account the ideological opposition within SYRIZA to some of the structural reforms being demanded, such as further liberalisation of the labour market. Speaking within minutes of each other at the Brookings Institute in Washington on Thursday, German Finance Minister Wolfgang Schaeuble and his Greek counterpart Yanis Varoufakis did not sound like two men who will easily see eye to eye soon. It has been clear for some time that in order to overcome this obstacle, the Greek side will have to make some concessions. This will require Prime Minister Alexis Tsipras to take control of the situation and try to convince his party that this is the least bad option they have at the moment. Tsipras so far seems reluctant to step into the role of enforcer. Although he has shown a pragmatic streak, even ruthless at times, as he led SYRIZA from a fringe group earning less than 5 percent of the vote to a governing party, he has so far been reluctant to confront his MPs. In fact, three months into his time in office, Tsipras appears to have little central control of his government. Hardly a day passes when ministers don’t issue contradicting comments, and the coalition’s strategy and goals remain unclear. Even if the government and its lenders find a way to fudge the issue now so Greece can hobble through the next few months, a reckoning is coming in June as there is no way that Athens can cover its 6.7 billion payments to the European Central Bank in July and August without outside funding. Until this uncertainty is resolved, the Greek state and the country’s economy will remain in a chokehold that is becoming more asphyxiating by the day. *This analysis appeared in Friday's e-newsletter. Subscribers can receive the newsletter via our free mobile apps or by logging in to our website.